Expect another hot one across the Upper Cumberland region today as temperatures will once again reach up into the 90's with plenty of sunshine. We'll call it 91° for the high in Cookeville. Areas toward Nashville will be slightly warmer while areas toward Crossville will be slightly cooler. Reminder: DO NOT LEAVE CHILDREN OR PETS UNATTENDED IN CAR FOR EVEN A MOMENT. 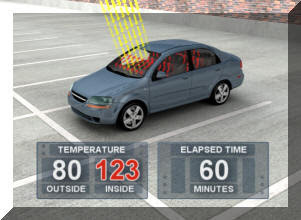 Look at the graphic below and see how hot a car will get when the temperature is just 80°. Thunderstorm chances hold off until Thursday and Friday. Even then the chances will be minimal. Monday's high in Cookeville was 90.3° at 4:03 pm while the low temperature was 62.6°. This morning's low was 64.7° at 5:21 am. There was no rainfall recorded on Monday and conditions across all of the region are quite dry. I've heard from several farmers and gardeners asking for a forecast of steady rainfall. Your 7-day forecast is below.